You must see this rare Harrison Model in Celebrate! 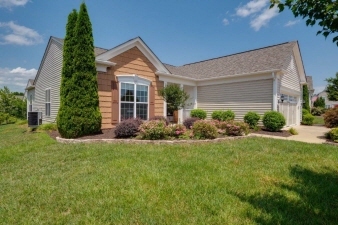 Interior Features -Rare Harrison Model - gently lived in - ready for you to call home. Sun drenched dining area and living room 17' x 21' - Open space to let your design imagination go. -Two generous bedrooms - owners has en-suite with soaking tub and separate shower. Additional Features and Amenities This 2 bedroom, 2 bathroom home has been gently lived in and is ready for you to call home! Just move in! The curb appeal of this home is divine, mature professional landscaping, architectural interest, and a carriage-style garage door. Inside this home the details will wow you. The cook of the home will love the gourmet kitchen with wood cabinets, granite countertops, and stainless steel appliances. The center island provides extra prep space for all your favorite meals. The attached breakfast room is light and bright and the perfect size. The heart of this home is the sun-drenched dining area and living room with fireplace. This large room is open, spacious, and ready to let your design imagination go! Such a large and flexible space with several options for furniture placement. An additional living space is provided in the den/study which is perfect for an office, craft room, or quiet place. This home has two generously-sized bedrooms including an owner's ensuite.